Stones, whether in their natural state or through human interaction, remind us of how our world ‘is’. A stone rock face, gradually exposed over millennia through contact with wind or water, can slowly reveal the secrets held within, telling us of what came before or tantalising us with what might still lie beneath. Carefully arranged in circles or lines, stones might indicate a place of ceremony or represent the heavens. Gathered together and stacked into cairns, stones can be navigational aids, burial markers or ways in which custodianship of surrounding lands is represented. In myth and legend, a stone may withhold a sword until the right person comes along to free it. A kiss on the Blarney Stone will imbue one with the gift of eloquence (but only if you do it upside down and backwards). Petrification or being ‘turned to stone’ sits within both classic and modern folklore to intimate wrath and vengeance, failure on a quest or shock. In some fairy-tales those turned to stone await redemption or heroic rescue, perhaps indefinitely. Of course, stones may be used functionally. They make great walls and long-lasting, well-insulated houses, implying permanence and tradition. Metaphors about stones have entered our language, for example, being ‘set-in-stone’ indicates the final, immutable action, and ‘stony-faced’ means an unchangeable, and perhaps even cold, expression. Flat stones found lying beside a river, lake or beach, can be seized upon and skipped joyfully. ‘Precious’ stones might be found in a glass of water or beneath a pillow as proof the tooth fairy really exists. Nearly every child has at some point felt the satisfaction of carrying a stone of the right shape and weight in his or her pocket. As adults we may still do so, perhaps having been gifted it by a child on a bush walk. Such stones act as both keepsakes and ways of reliving a special moment or place. Stones, imbued with culture, history, folk-lore, language, art and ceremony have long been considered useful tools in both educational and therapeutic work, as tactile metaphors to describe human differences. As a publisher of strengths-based, conversation-building tools, Innovative Resources is a fitting place for A Pocket of Stones to have laid its foundation back in 2003. And these twelve stone characters have remain unchanged to this day—same timeless expressions, but now with a new booklet containing more questions and activities for facilitators to use. 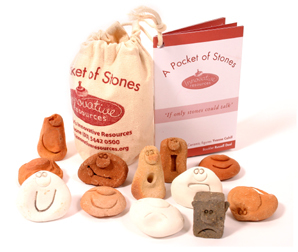 The idea for A Pocket of Stones was first conceived by Russell Deal, the former creative director and founder of Innovative Resources. The twelve small ceramic heads are hand made by Yvonne Cahill, and complement Stones … have feelings too! (a card set illustrated by Ray Bowler and published by Innovative Resources) and The Wrong Stone (a picture book written by Russell Deal and illustrated by Ray Bowler). These twelve ceramic stones can playfully represent a wide range of human emotions anywhere from happy, sad, loud, and quiet to angry, complacent, confused and suspicious. Use them to talk about your family, work team, community or society. Use them to tell stories and speak about your feelings, goals, values, hopes or dreams. From A Pocket of Stones booklet written by Andrew Shirres and Karen Bedford. Products available separately (Follow links below, or as a value pack).